Are Exec Ed Programs Worth it? These expensive courses require a chunk of time away from home and office so some people never even consider them. Others hear the siren song, lured by visions of Ivy League campuses, exposure to known thought drivers, subject matter immersion without distraction, and an opportunity to prove they have what it takes in an elite environment. Earlier this year my friend/colleague Bob Gerberg, CEO of Advanced Career Technologies,* participated in Harvard’s week long, Leading Professional Service Firms executive education program. I thought it was the perfect opportunity to learn more and interviewed him for this article. First, why Harvard? 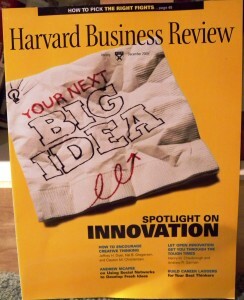 Many years ago, Bob had worked for Bausch and Lomb in Boston so the Harvard Business School has been on his radar for a long time – he reads HBR regularly and is on the school’s mailing list. Being in the career services field, he is also acutely aware of how important it is to keep one’s ideas and skills fresh. Not only is Harvard known for its superior executive education, but attending a HBS course would give him the opportunity to visit Boston and see some old friends. Going into it, he had high expectations around content given the Harvard brand, and his goal was to walk away with 2- 3 significant ideas he could put into action in his own business. The value of the content was amplified by the interaction with his fellow students and professors. His 6 day course was attended by130 students from 40 countries. Professors facilitated very intense, ping pong type discussions that expanded the thinking without making anyone right or wrong. Bob described the professors’ people skills as “unbelievable” which had surprised him. He expected brilliant researchers who were subject matter experts, but they were also gracious and funny, skilled at driving discussions and debate while ensuring no one was embarrassed. So given his enthusiasm, you’re probably thinking Bob has a big HBS tattoo somewhere. And while he might, he did stress that in choosing a course the most important thing to consider is alignment with your specific need – not length, location or institution. *ACT combine’s technology with personal services to help professionals and executives find the right new job…in the U.S. or worldwide. We’ve all heard “what got you here won’t get you there”, yet we still tend to lean heavily on our trusted strengths and strategies when stretching for something new. Sometimes that works, but often it doesn’t because what we’re aspiring to requires a different skill set. 1. What are the critical skills, abilities and qualities required? 2. How am I perceived relative to those crucial factors? 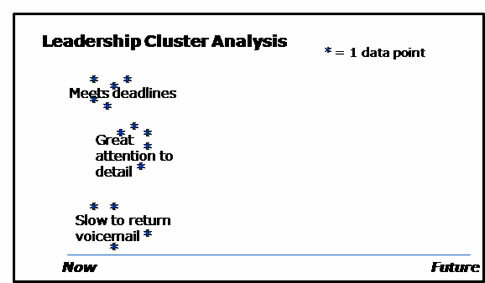 To help clients prepare and position for their next role, I created a tool that (very) loosely links the above idea with cluster analysis. This statistical technique groups similar data points into discrete categories to aid in analysis. Don’t let the thought of stats stop you; this tool is elegant in its simplicity. Imagine what you do and say as a stream of data points flowing into your environment and available for assessment by your boss, colleagues and customers. Over time, these people will frequently experience related data items and this group of similar impressions forms a cluster. For example, every time you close a deal or hit a revenue goal, you’re adding another ping of data to your “meets targets” cluster. As this cluster develops significant mass, this trait becomes one of the things you are known for. Clusters can represent both desirable and undesirable traits. 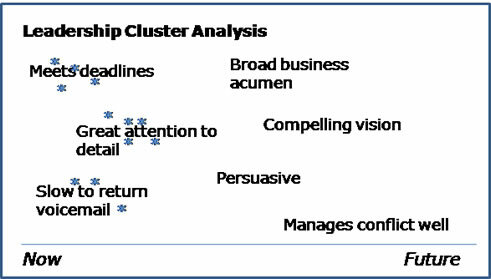 The collection of all your clusters presents a composite of your current leadership style. 2. Incorporate New Clusters As you anticipate your desired career path, what skills, abilities and personal qualities will be advantageous? Consider things you already do well that will carry forward as well as new, mandatory requirements for your next position. Demonstrating strength in the core competencies of your current position casts a positive glow, which makes it easier to be noticed, but also only confirms that this role is a good fit. It doesn’t mean you will be perceived as ready for the next step. 3. Shift Perceptions Through Focused Activities Now the fun starts as you define the desired “clusters”, start to populate them with “data” through your actions, and ultimately become associated with these characteristics as well! (At the same time, look for ways to depopulate undesirable clusters.) This step requires strategizing to create options; it may be useful to have your boss, mentor, coach or experienced colleague help. 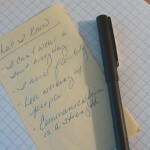 Consider activities that boost your expertise in these areas and make it visible to others. For example, attend a course/read a book on strategic planning and then present an overview to the team, or volunteer for a companywide initiative that will build new experience and greater visibility. 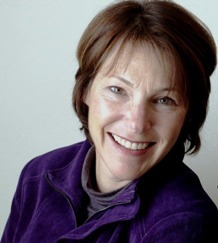 One client, who had never managed people, volunteered to run the organization’s major philanthropic activity involving the coordination of numerous volunteers. This success enabled others to see her potential and support her bid for a managerial position. Sometimes reinforcing a cluster is just a matter of tweaking how you express yourself, using language and tone to change perceptions. Recognize that this is not an overnight process, it takes time to catch people’s attention and build trust in the trend they see forming. This diligence, however, yields another reward; people recognize the courage, commitment and openness required for creating such a shift and those characteristics become valued clusters in your profile as well.